A high-speed database converter carefully engineered to efficiently handle even the largest databases. Note: Full Convert is not designed to migrate views, stored procedures, functions and triggers. Use our SQLTran for that. 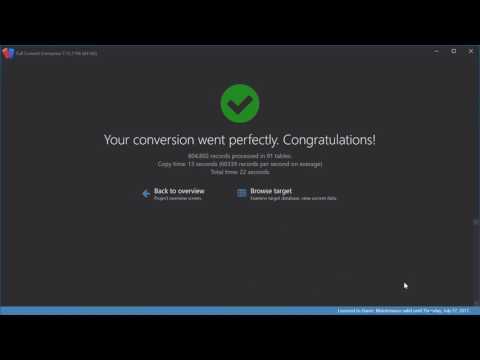 Full Convert was added by mmioc in Aug 2018 and the latest update was made in Apr 2019. The list of alternatives was updated Aug 2018 There is a history of all activites on Full Convert in our Activity Log. It's possible to update the information on Full Convert or report it as discontinued, duplicated or spam. MSSQL-MySQL Sync is a program to synchronize databases between SQL Server or Azure SQL and MySQL, MariaDB or Percona. DBConvert for MS SQL and MySQL software for data conversion and synchronization from Microsoft SQL Server to MySQL database and from . MySQL to MS SQL Server . Database converter for migration of Microsoft Excel files to MySQL with integrated data selector. This is a simple online tool for turning Microsoft Excel, LibreOffice Calc and CSV files into code for MySQL table structure and data. Alternatives to Full Convert for Windows, Web, Software as a Service (SaaS), Mac, Linux and more. Filter by license to discover only free or Open Source alternatives. This list contains a total of 7 apps similar to Full Convert. No reviews yet for Full Convert, want to be first? Maybe you want to be the first to submit a comment about Full Convert? Just click the button up to your right!